A self-tying wire that stays put, this copper specialty wire from OOK is ideal for wire sculpture, art projects, decorating, jewelry making, and fastening. 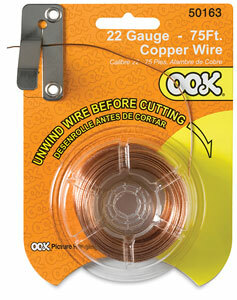 Ook Copper Specialty Wire is packaged on a blister card with a built-in wire cutter. Soft and flexible, it won't stain or cut hands during use.